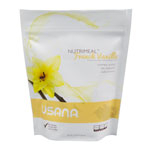 USANA French Vanilla Nutrimeal - Fast food or no food. Too often this is a choice we’re forced to make. We know you want exceptional nutrition in everything you eat. We also know that you are incredibly busy. Between work, exercise, and a list of errands a mile long, the last thing you want to do in the morning before you run out the door is cook breakfast! But breakfast is where a healthy lifestyle begins! That’s why USANA developed tasty and convenient Nutrimeal shakes.